Adafruit customer service forums • View topic - LOCKED- READ THREAD, BUYER BEWARE - Xoxbox group buy ~ $450? Re: completed Xoxbox group buy, ~ $450? Seems pretty intentional to me. :? He dose have good taste in panel design. Hahahaha! I did a double take last night when I looked at the user manual PDF and saw a C-flat button. Willzyx Music wrote: EDIT: sorry for the sharky comment- I hope you guys have a successful group buy. I'd really like to make my new x0x look more like Phono's! Helyx525 wrote: PS, can we PLEASE not get into any flame wars over his opinions on kit builder success rates? Thanks. I dont think he was trying to intentionally make any digs against Adafruit or builders in general. Finally the benevolent leader Cy is here to overcome the ineptitude of the unwashed masses! I would like to appologise if anyone was offended by Cy's email. I spoke with him today and, having spoken with him quite a lot over the last month, I believe him when he says he did not mean to disrespect Adafruit or the xox builders community even though it may have come across that way. While I personally would have phrased things differently, I believe he was primarily expressing concerns about scammers selling fake parts and limited stocks of rare parts going to _some_ kit builders who bit off more than they could chew. I believe there are plenty of successful x0x builders out there going by the number of satisfied owners visible online and he wasnt talking about them. 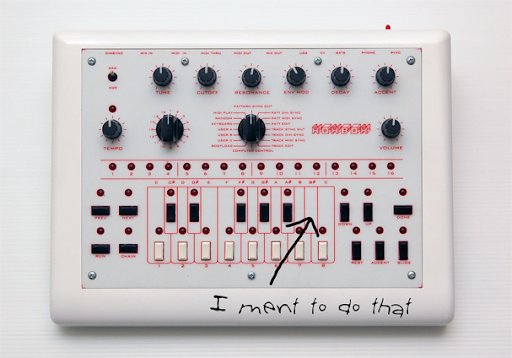 I've built many DIY synth kits and talked with people that make them over the last 10 years and I know that success rates very widely depending on the complexity of the kit. I doubt that everyone that tried to build a x0xb0x succeeded. This fact is no fault of either Adafruit or the x0x builder community, so please try not to take it as such. The x0xb0x is a tremendous accomplishment for both the designer and the builders. In short, Please dont flame Cy over that message. There seems to be a bit of a language barrier at work here. He wasnt trying to make a declaration from on high. While so many companies are motivated only by profit, he pursues this out of a love for rare synths and even sells some parts like 303 battery doors at a loss. He has been providing rare synth parts to the DIY community for over a decade now and has had to deal with a lot of problems that we dont usually see. Those frustrations can sometimes come across the wrong way. Well, we are in the final stretch now. Still waiting for Cy to post the xoxbox info on his site. He said it would just be the same info from the ebay auction and his email. The current committed buyers are satisfied with Cy's responses on build quality and warranty info so far. I have begun collecting money via paypal and will place the order on or around 5-26-2010. The current price is USD$400 since we have more than 12 units in the buy. Shipping within the US is $11 via USPS flat rate box. PM me if you are interested in joining us. When Cy is gonna post the info on his site? spybar wrote: When Cy is gonna post the info on his site? The deadline for the buy is technically the 31st, but I didnt want to cut it that close. I wanted to have the money collected by Monday the 24th and the order placed by Wednesday the 26th. I emailed Cy again. Hopefully we will hear back from him soon. I can push the buy back as far as Saturday, but I cant wait any later than that. Would you feel more comfortable buying one of the leftovers after the group buy is completed? I can provide you with pics and audio/video of the unit once it arrives. As I mentioned before, I am willing to buy one or two extra units and sell them later if necessary. As of today, we are short one buyer in Israel due to sudden unemployment syndrome, so it looks like I will be buying one extra. Would you feel more comfortable buying one of the leftovers after the group buy is completed? I would love to buy in THIS group buy. BUT it is very hard for me to understand, why Technology Transplant (or Cy) is so "mysterious"... I mean about 15 x0xb0x are gonna be bought at once, each for $400 = total $6,000 at once. Why, after about 2 weeks of asking, they can't put their own statement, with their own signature online? They can even write 3 sentences, or even copy/paste their email that was quoted above. Something. Pretty please. Looking forward your reply... and hopefully Technology Transplant statement. Cy emailed me this morning. He appologized for the delay. He crashed the site and it took a day to get it back online. The good news is x0xb0x page is now up. Additional info to be posted on the page soon. that means that i dont need to replace nothing inside :mrgreen: good to hear such a gr8 news. Electrolytic capacitors from Panasonic or Rubycon. Polyester capacitors 5% selected. Rotary encoder 16 position switches with better structural build by Technology Transplant. Custom MC-303 type knobs and caps by Technology Transplant. Switch caps are non-gloss and better scratch resistant than originals. 1% transistor throughout VCO and 5% elsewhere for sound excitation. Super high beta 2sa733K (>450) in Q9 & Q10 and elsewhere. Super low beta 2sc536(>150) throughout. 2sc1815 throughout moog ladder for best transistional phase response per final Roland revisions in the TB-303. 2SK30AY & AO (Toshiba equivalents) for best matching. Alumimun back-plane & top panels with arrow marks for up/down & prev/next functions. Power switch built in and ships with appropriate adapter for your location at 110v 500ma for USA & Canada. "2sc1815 throughout moog ladder for best transistional phase response per final Roland revisions in the TB-303." All but one of the current 12 committed units has been paid for. The remaining person will pay some time today or tomorrow. Since we didnt get Cy's webpage until yesterday I have decided to wait a few days to place the order. It will be placed on Friday, May 28th at 9PM Eastern Standard Time. It should take about a week to arrive at my home at which point I will post pictures and distribute them. Thanks all, especially Isak for all your hard work on this!